Paul Farmer has battled AIDS in rural Haiti and deadly strains of drug-resistant tuberculosis in the slums of Peru. A physician-anthropologist with more than fifteen years in the field, Farmer writes from the front lines of the war against these modern plagues and shows why, even more than those of history, they target the poor. 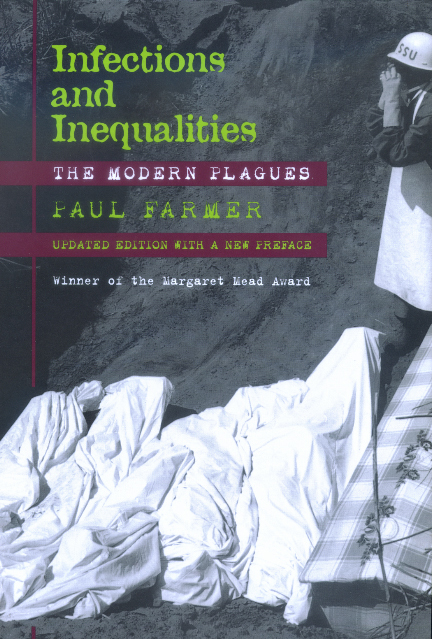 This "peculiarly modern inequality" that permeates AIDS, TB, malaria, and typhoid in the modern world, and that feeds emerging (or re-emerging) infectious diseases such as Ebola and cholera, is laid bare in Farmer's harrowing stories of sickness and suffering. Challenging the accepted methodologies of epidemiology and international health, he points out that most current explanatory strategies, from "cost-effectiveness" to patient "noncompliance," inevitably lead to blaming the victims. In reality, larger forces, global as well as local, determine why some people are sick and others are shielded from risk. Yet this moving account is far from a hopeless inventory of insoluble problems. Farmer writes of what can be done in the face of seemingly overwhelming odds, by physicians determined to treat those in need. Infections and Inequalities weds meticulous scholarship with a passion for solutions—remedies for the plagues of the poor and the social maladies that have sustained them. Paul Farmer directs the Program in Infectious Disease and Social Change at the Harvard Medical School and divides his clinical time between Boston's Brigham and Women's Hospital and the Clinique Bon Sauveur in central Haiti. He is the author of AIDS and Accusation (California, 1992), which was awarded the Wellcome Medal, and The Uses of Haiti (1994), and editor of Women, Poverty and AIDS (1996), which won the Eileen Basker Prize. "Farmer's work diverges strikingly from the current 'emerging infectious disease' literature, much of which misses essential points about causation that Farmer brings out very well. . . . It is sure to appeal to those general readers attracted to books like Garrett's The Coming Plague, as well as to readers in medicine, public health, and the sociomedical sciences. "—Frederick L. Dunn, M.D.